Animated: No; Low-poly: Yes; Materials: Yes; Rigged: No; Textured: No; UV Layout: No; 3D File Formats Included: .3ds (multi format), .blend (blender), .fbx (multi format), .obj (multi format); Created In: blender; Geometry: Polygons; Poly Count: 500. All 3D models are low poly and ready for using in game development. If you want decrease count of faces ЁC I recommend to use decimate modifier in Blender. But you can use any other method in your favorite 3D soft. Some of 3D models contains gradient materials. If you have any doubt or trouble, please do not hesitate and contact me to solve it. 3D Globe; 3D World Map with Countries; 3D World Map High Res; 3D World Map Low Poly; Sword Base Mesh (C) ; Nice Low Poly Monster; Low Poly Tiger (Red & White). Keywords: 3dmodels, 3ds tree, app trees, forest, game development, gamedev, gameready, grass, log, logs, low poly, low poly tree pack, low poly trees, lowpoly, lowpoly tree, mushroom, mushrooms, nature, oak, oaks, snowman, stl printable trees, stone, stones, tree pack, trees, trees pack, vegetation. Best stock graphics, design templates, vectors, PhotoShop templates, textures & 3D models from creative professional designers. 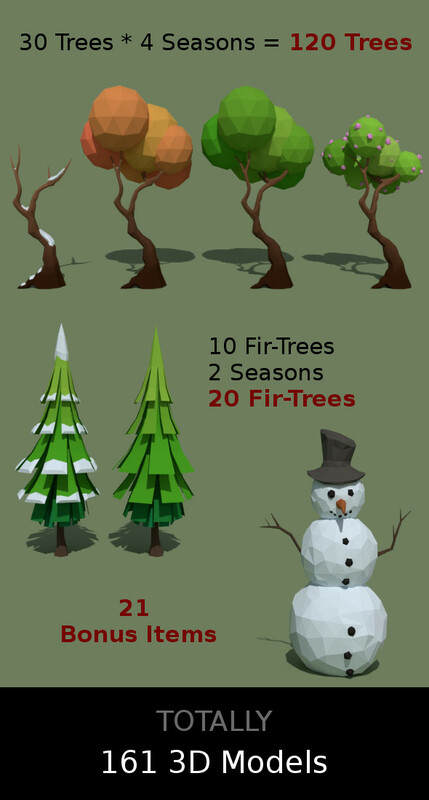 Create 3DOcean 140 Low Poly Trees & 21 Bonus Items 20850586 style with PhotoShop, Illustrator, InDesign, 3DS Max, Maya or Cinema 4D. Full details of 3DOcean 140 Low Poly Trees & 21 Bonus Items 20850586 for digital design and education. 3DOcean 140 Low Poly Trees & 21 Bonus Items 20850586 desigen style information or anything related.